I don’t know what it is with this day, if it’s the weather or maybe I’m still in Sunday mode, but I’m tired. All I’ve wanted to do today is lie on the couch and watch TV or read a book. I’ve done more than that, obviously, but oooh how I wish I was one of my cats and lying on the couch was my job. Right next to eating and getting all happy-high with a catnip toy. Sunday was amazing though. If you read this post then you know that I was in Planica! We slept for about 2 hours, before waking up with the birds on Sunday morning and walking to the train station at 5:45. There was already a big crowd of people there, with their flags and other cheering props, waiting for the train. We were all going to the same place, a bunch of strangers, but it felt like we were on a school trip. With this being the biggest sporting event of the season, big enough for our president to come and watch it, the location of the competition was of course insanely crowded. We were told there were about 33.000 of us in total, which is a lot for our standards. Judging by the flags alone, the Slovenes were the majority, but there were fans there from all over Europe. We just had so much fun. I know you’re supposed to have a good time when you go to something like this, but you should know that I’m not a sports person at all. Ski jumping is one of the few sports I’ve always enjoyed watching, if not the only one. And this season was very special with one of our jumpers pretty much taking every title and breaking records of all sorts. But really, watching something like football (soccer) is pure torture for me. I might watch a game or two during the World Cup, but that’s as much as I can give. Anyway, I don’t want to bore you too much. Or maybe I’m not boring you at all? We came home around 6 in the afternoon, completely worn out. Happy, but worn out. The train ride back was incredibly hot, so we grabbed an ice-cold coke and a small milkshake from McDonald’s as we walked home. And it’s now taken me two days to recover from all of this, which is crazy. Which brings me to this millet porridge. You see this is the kind of breakfast I need when I’m not at my strongest. It’s healthy and so filling. I like to add a bunch of things to it to make it super good and I just know I’ll get all the much needed energy from it. 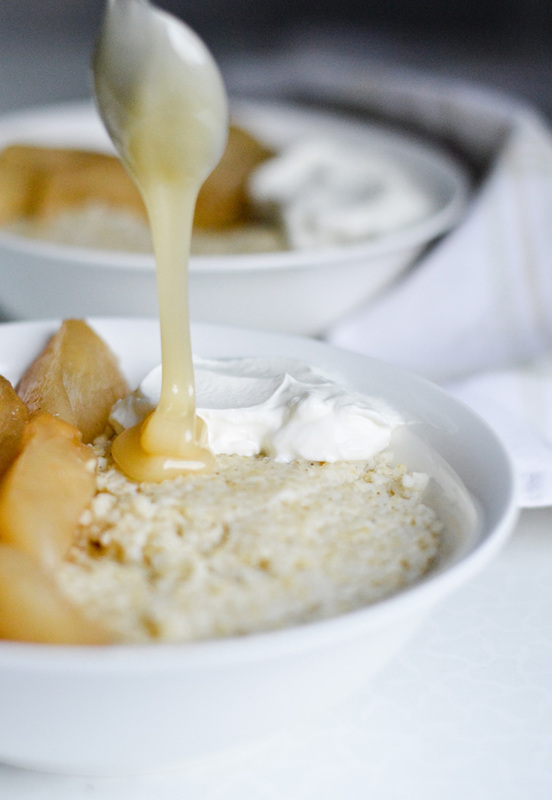 Now, I do already have a millet porridge recipe on here that is made with apples, but this one today is a bit different. Better even. 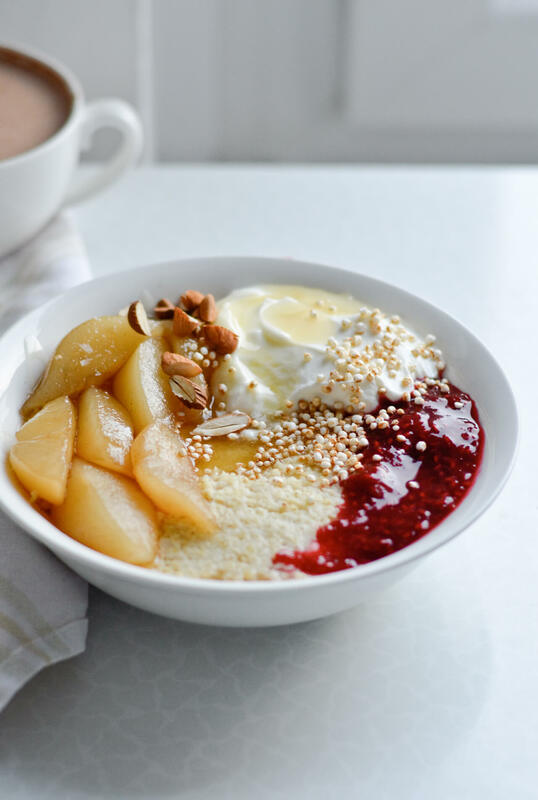 The maple poached pears add so much flavor to it, along with Greek yogurt, honey, chopped almonds, puffed quinoa and raspberry sauce, which was leftover from these rolls. Yes, I just listed a bunch of toppings. You don’t have to use everything or the same exact things, because the beautiful thing about millet porridge is that you can add anything to it. But I love a combination of fruit and yogurt, or if not that at least some honey or sauce of some sort. 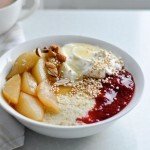 I like my millet porridge creamy but dense, so a little syrup or sauce really takes it to another level. Adding a bunch of different toppings makes it even better and a lot more fun. With a little bit of multi tasking you can have everything done in about 20 minutes, especially if the pears you’re using are very ripe. 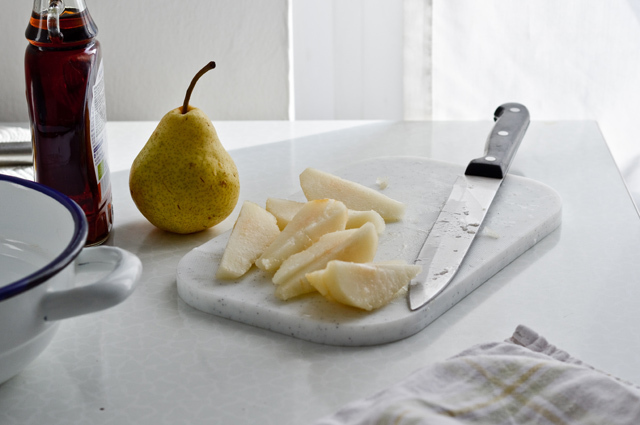 And about the pears, which are sweet, soft and just dreamy; the recipe for them is inspired by Molly from Orangette who made something similar with quince. 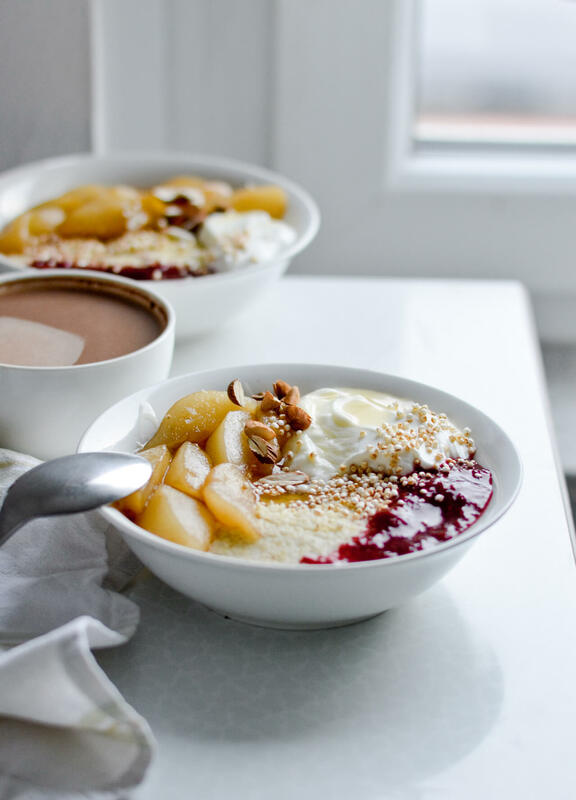 And you can easily eat quince instead of pears with this millet porridge if you’re in the mood. 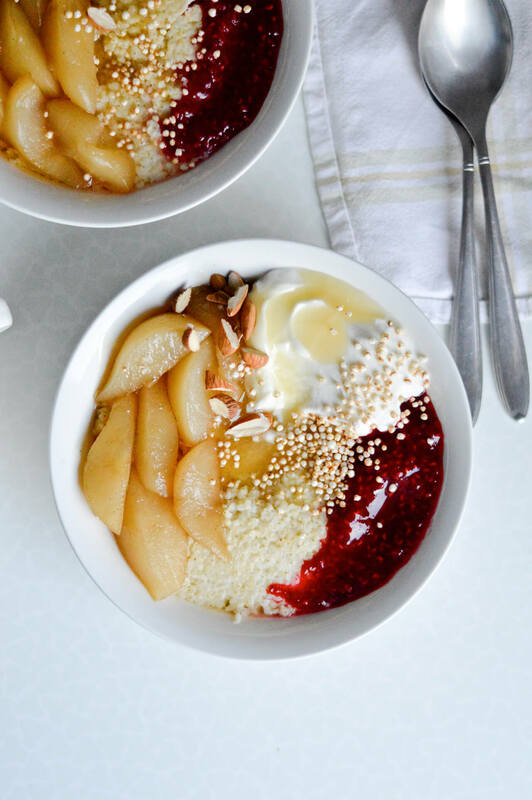 All in all, this creamy millet porridge is a true breakfast of champions, perfect for this moody spring weather. A breakfast that is nourishing and filling. 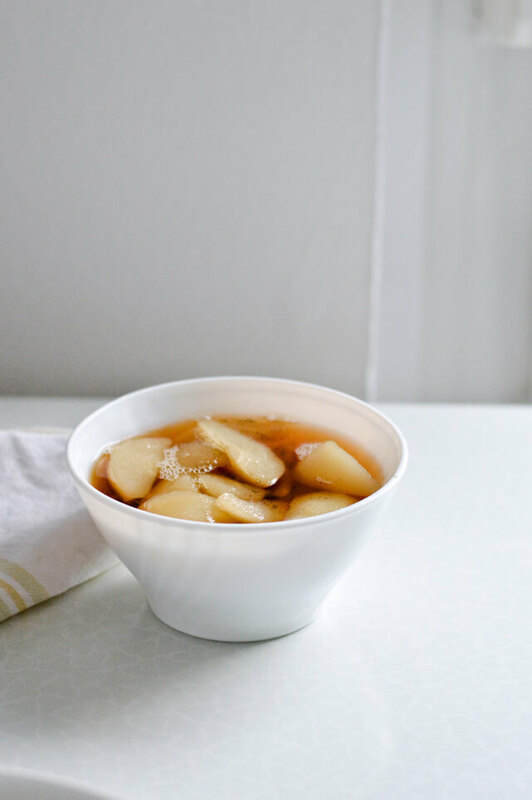 Combine maple syrup, salt, water and pear wedges in a medium saucepan. Bring to a simmer over medium-high heat. Then lower the heat, keeping a gentle simmer and cover pan loosely with a lid. 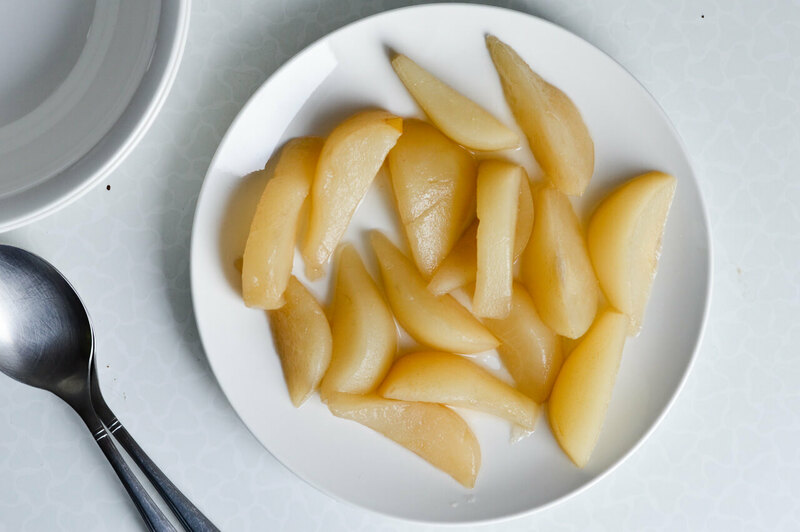 Cook gently until the pears are tender and can be easily pierced with a thin knife. It they’re very ripe this can take as little as 10 minutes. Remove the fruit from the pan to a bowl, but keep the liquid in the pan. 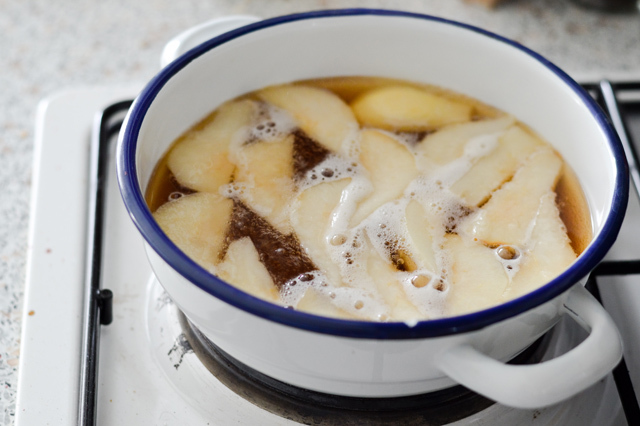 Raise heat to medium-high and simmer, stirring frequently, until it has reduced to about 1/2 of its original volume. Then pour it over the fruit and allow it to cool completely. Combine millet, water, almond milk and salt in a saucepan and bring to a boil over medium heat. Cook on low simmer for 10-15 minutes, stir occasionally to prevent millet from sticking. 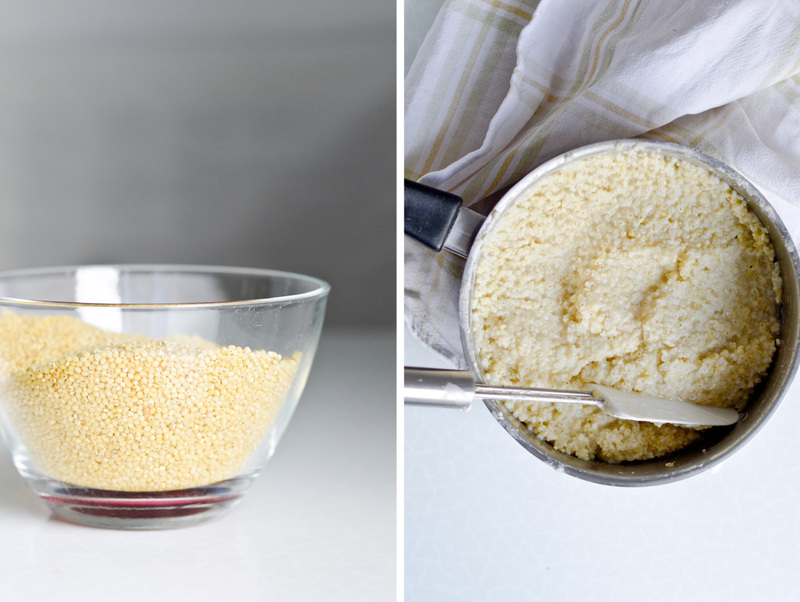 Once the millet has puffed up a bit and is tender when you taste it, it is done. Remove from heat and serve immediately. 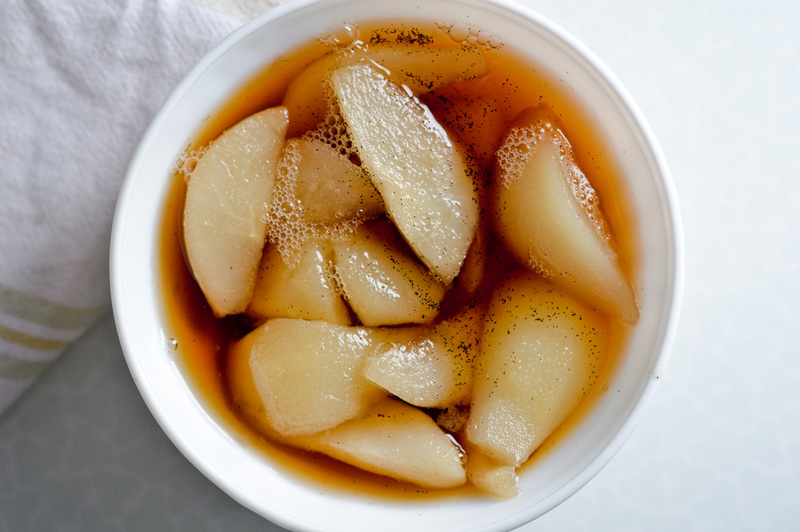 Spoon it into bowls and top with poached pears, yogurt, honey and anything else you like. Sounds like you had a beautiful Sunday. This porridge looks incredible! I have never tried millet before, but need to replace it with my oats ASAP!